The new Xbox will be smaller, cheaper, and with Windows 9. And here once again, a glorious buzz about the new console from Microsoft , that we call the Xbox 720 , Xbox Next and now called Loop - but as they say these "reliable sources", "Loop" is the code name for this long-awaited next-generation console. The new Xbox console (720, Next, etc.) will be smaller and cheaper than the Xbox 360. 'll Use a modified version of Windows 9. "Loop", use the Zune HD hardware as the main platform processor with multiple cores will dedicated to processes audio, graphics, AI, physics, networking, encryption, and sensors. The processor will be designed by Microsoft and two partners based on ARM processors. If they wanted information about the new console from Microsoft, well, here's a little to imagine what it would be capable. But of course this is not possible to corroborate information and you can be content with that, imagine the power, imagine the platform and especially the multi-core processor and dedicated. Not until the next E3 , when we have accurate information regarding the power of the next Xbox ... 720, Next, etc.. The best games of BEN 10 for PC. Sometimes we focus on the many great games super productions worldwide, including Call of Duty, Battlefield 3 or PES 2012, but actually this kind of games are very difficult to get monetarily speaking, and in order to play would be done in a console specific cost quite high. So simple it is sometimes the best option to have fun without any cost and that's better than being with Ben 10 games are the most suitable for all ages. You'll find everything you need to play quietly Ben 10 vs games like Allien, Ben 10 and Ben 10 Moto Kart Champ Game. I present the 3DS Cosmic Black. This is the portable Nintendo , 3DS limited edition for the 25th anniversary of Zelda and as you can see in the pictures, it's not bad. Unfortunately for those who live in America, this issue has only been announced for Europe. The 3DS Cosmic Black, is a console Zelda game reasons, we can see the front of this, the image of Hylian shield and designs alluding to this play Nintendo. The Japanese still have not put a price on this notebook, the only thing we know, is that the bundle will include the console and the game The Legend of Zelda: Ocarina of Time 3D, will be available starting November 25. Can a limited edition Zelda, help sales of the console? It is well known by all, that Nintendo is going through a rough patch, many say it was a mistake to bet on 3D technology on a laptop, others attribute it to these losses are a reflection of the games "recycled" of the company. Honestly, I have not put me at the controls of a console of the large N, but it's really sad to know that one of the largest companies in the industry, have this kind of problems. Will WiiU support more than one Controler or Tablet? Will WiiU support more than one controller or tablet? One of the most controversial aspects about WiiU was denying the possibility of interacting with the new driver to more than one concurrent user. Some developers uncovered Nintendo guidelines about asking them to create their titles in a single tablet thinking machine. Another debate was very different in the nature of such a limitation: do WiiU was not able to move two controllers at once? Few approved this version, preferring rather a question of economics. The cost would be prohibitive separate tablet, so the Kyoto announced that they could acquire more than associated with the console. What if I told you that Iwata and company have heard criticism from users and developers? A machine control becomes all nonsense, especially in regard to multiplayer games. Nintendo knows it needs to support at least two tablets. Currently working to make it technically possible, even if it affects the framerate of games. [..] As a developer and as a player, no matter what it costs me: Wii U should support two displays. If you are developing a set of questions is that the framerate does not bother you much exactly. Who speaks it is a 'renowned executive' of the industry. 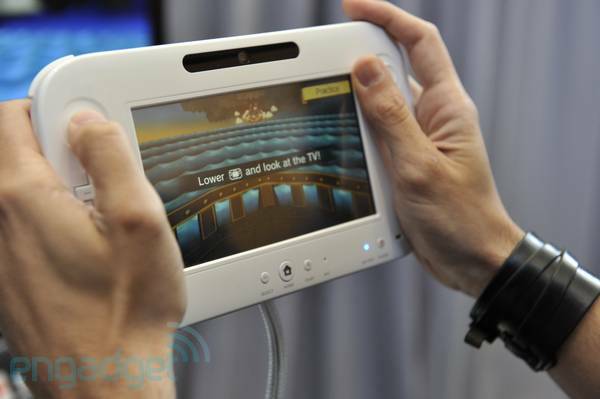 He bases his claims on code changes detected in the SDK, which suggest support U Wii Dual Tablet. It also uncovers the RAM and processor speed U Wii are still to be determined. In the last hours also a Nintendo patent shows another possible solution to the mess: Touch screens fitted at the controls of Wii (Wii-compatible U) through a periscope-shaped peripheral. So the other players would Tablets miniature U Wii that complement the original. A second option shuffle, but less likely so expensive, would be compatible with Wii 3DS U, turning the laptop on another sort of extra screen. Anyway, for now we remain with the official version, since there is no confirmation that Wii U end supporting two tablets. At least, as we have seen, there are feasible solutions. We'll see what happens next summer, when launching the console.